Here at Aurora Skin Clinics we sell an advanced skincare range called NeoStrata. This range of products provides scientifically proven results on the common signs of ageing and sun-damage. We offer a range of products here at Aurora including Neostrata which is our cosmeceutical range. If you think about a medicinal product and a cosmetic that you might find on the high street and put the two together, you’ll find a cosmeceutical. What that means is it’s a lot more results driven and it will penetrate a lot deeper into the dermis, into the lower layers of our skin where our collagen and elastin fibres are found. In addition to that we have a real focus on Heliocare, so sun protection. It’s a crucial element of any skincare product range that you’re using at home and the Heliocare is only SPF 50 which is really important to use pre and post treatment. Neostrata was created by Dr. Van Scott and Dr. Yu who are both recognised as leaders in the field of dermatology. They are also the creators and patent holders of the first glycolic peel. With this they discovered the rejuvenating power of Alpha Hydroxy, Polyhydroxy and Bionic Polyhydroxy Acids. Each of these ingredients are also found in their product ranges. They have won many awards in dermatology and continue to develop new technologies to treat ageing skin. What do the acids do? Exfoliates the skin and enhances cell turnover, this improves fine lines, open pores and pigmentation. It also increases collagen fibres which gives the skin a firmer appearance. Gluconolactone is found naturally in the skin, it has great anti-ageing benefits without irritation, so works well for anyone with sensitive skin or rosacea. It is also a powerful antioxidant that helps preserve healthy tissue and maintain elasticity. Lactobionic acid helps reverse the signs of photo ageing, including fine lines, pigmentation, enlarged pores and roughness. It also promotes firmness by binding water to hydrate the skin keeping the skin healthy and plump. How are the NeoStrata skin care products absorbed by the skin? 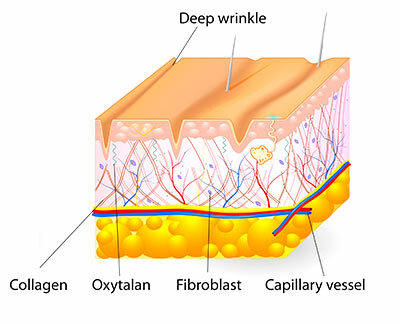 Looking at the diagram above, most cosmetic products will sit on the top of the epidermis with little absorption into the skin as they do not have the active ingredients to do so. The top layer of dead cells on top of the epidermis will also prevent any absorption from happening. Cosmeceutical means half cosmetic and half pharmaceutical which means these products contain active and more potent ingredients. Its molecular structure is a lot smaller so they can penetrate through the dead cells removing them with AHAs and absorbing into the deeper dermal layers of the skin. This means the active ingredients will then stimulate the skin encouraging new cells and boosting collagen and elastin. This will result in your skin looking much plumper. Therefore cosmeceuticals are much more beneficial and will make a noticeable difference to the skin, unlike some skincare products sold on the high street. During a consultation your practitioner will assess your skin, asking you questions about the concerns you may have. We will highly recommend a skin analysis with our Visia Skin Analysis machine which will give a more in-depth look at the condition of your skin, highlighting problems before they may even be visible to the human eye. With this information we are then able to guide you to the best NeoStrata product that will best suit your skin and treat certain problems you may have. Having 6 ranges of products varying from resurfacing and anti-ageing to sensitive skin products, your practitioner will find the best one designed for you alongside a bespoke treatment plan. To book in for a consultation with one of our expert practitioners please give us a call on 01844 318825.